The New York Times reported 21 October 2010 that coalition forces may be making gains against the Taliban, in part due to the Army and Marines Himars (High Mobility Artillery Rocket System) firing the highly precise Guided Multiple Launch Rocket System. Writing in Slate, Fred Kaplan notes that " the accurate rockets are only a part of the story. More important are the huge advances in intelligence gathering-again, just in the last few months-that have let the U.S. artillery troops know precisely where the bad guys are and, therefore, where to aim their big guns." The story was not always so happy. On Feb. 14, 2010 International forces in Afghanistan suspended use of an artillery rocket system, pending a review of an incident in which two rockets missed their target and killed 12 civilians in Afghanistan's Helmand province. Army Gen. Stanley A. McChrystal, International Security Assistance Force commander, conveyed his apologies to Afghan President Hamid Karzai for the incident that occurred as Afghan and international forces continue an operation to clear a Taliban stronghold. "We deeply regret this tragic loss of life," McChrystal said. "The current operation in central Helmand is aimed at restoring security and stability to this vital area of Afghanistan. It's regrettable that in the course of our joint efforts, innocent lives were lost. We extend our heartfelt sympathies and will ensure we do all we can to avoid future incidents." Two rockets from a High-Mobility Artillery Rocket system missed their intended target, killing 12 civilians in Helmand's Nad Ali district. The rockets' target was a compound where insurgents were delivering accurate, direct fire on a combined Afghan-ISAF team, officials said. An Afghan soldier and an ISAF servicemember had been injured by the insurgent fire. Affectionately referred to as the "70km sniper round", the GMLRS Unitary has a 200lb High Explosive (HE) warhead for attacking point targets with reduced collateral damage by providing a "one round, one kill capability". 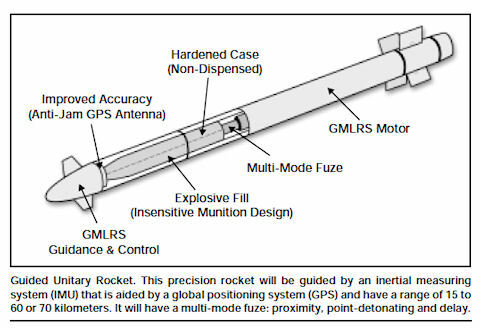 GMLRS unitary is the Army's only surface-fired, precision, longer-range indirect fire munition available to troops in contact in an urban environment. GMLRS is a precision munition providing increased range to 70KM, and Global Positioning System (GPS) accuracy. GMLRS unitary has three fuze settings for use against personnel in the open (proximity fuze); lightly fortified bunkers (delayed fuze); or a single, lightly armored target (point detonating fuze). The new Tri-mode fuze allows airburst, point impact and delay modes forpenetrator capability. Proximity sensor firing mode is selectable for 3 Meter & 10 Meter height of burst [HOB] at approach velocities near Mach 2.5. The Guided Unitary Rocket is fired from both the M270A1 and the HIMARS Launcher. The Guided Unitary Rocket is packaged in, and fired from, a Launch Pod Container (LPC) which has the same height, width, and length characteristics as the current Multiple Launch Rocket Systems LPC. The Guided Unitary Rocket is equipped with a Guided Multiple Launch Rocket System (GMLRS) motor, a guidance package, and carries a warhead/payload which provides us the capability of attacking a variety of targets to include those that require low collateral damage. The growth potential inherent in the Guided Unitary Rocket modular design shall be maintained as new lethal and non-lethal technology advances are evaluated for insertion. The Guided Unitary Rocket is designed to allow handling and maintenance within the current system. GMLRS Unitary had its Milestone B decision in March 2003. It was scheduled for a 4QFY06 Milestone C, 2QFY08 initial operational capability, and a full-rate production decision in 3QFY08. Depending on the results of initial testing and a validated need, an early version of the rocket could be fielded sooner than 2008. In October 2003 Lockheed Martin was awarded an SDD contract for 86 unitary variant rockets, to last until 2007. 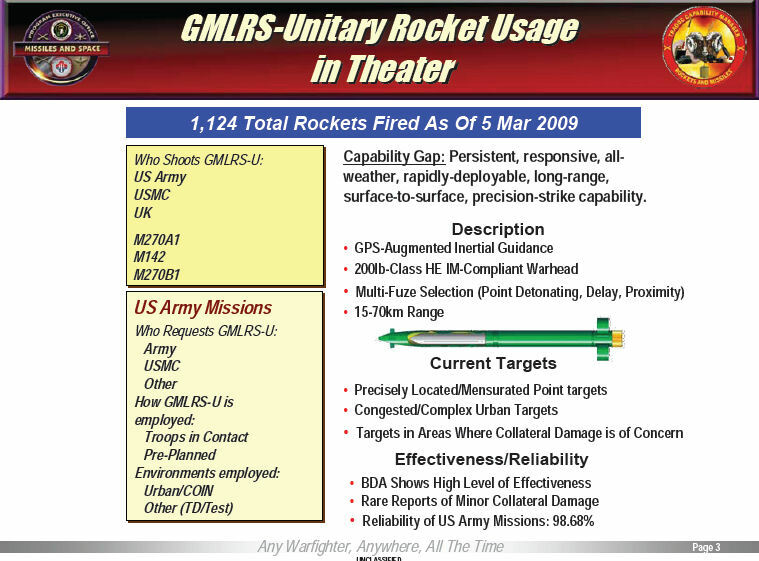 The first XM31 Guided Unitary was delivered in May 2005, following a US Army Urgent Need statement. In August 2005 the XM31 Guided Unitary variant began field testing in Iraq. 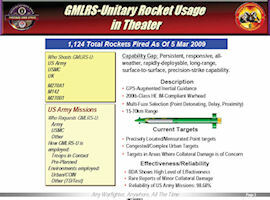 A total of 498 XM31 rockets were delivered to the U.S. Army Q3/Q4 2005. In September 2005 the XM31 GMLRS Unitary was fired for first time in combat operations by 3rd Battalion, 13th Field Artillery (3-13 FA), 214th Field Artillery Brigade. By 2007 over 2000 units had been delivered. The massive growth of urban areas and manmade changes to the landscape significantly affect the conduct of battles. Commanders at all levels must be aware of the unique advantages and disadvantages associated with operations conducted in and around cities, towns, villages, and similar built-up areas. Special techniques may be used in attacking the defilade areas between buildings. Increasing the target altitude used in the Fire Direction System (FDS) and Fire Control System (FCS) allows munitions to achieve a more vertical fall prior to detonation and thus clear buildings and other obstructions. Commanders must still consider the precision error and munition dispersion patterns when applying this method of attack due to the high probability extensive collateral damage. Low-level winds at the target area will add to the precision error. Command and control of a firing platoon operating in an urban area are demanding. Decentralization to the maximum feasible extent may be required. The reduced ability to communicate and extended platoon frontages necessitate more detailed orders and SOPs. Tactical communications in the firing platoon area are severely affected. The height and density of structures will reduce the planning ranges for all organic radio equipment. Wire takes on added importance. It is less vulnerable to disruption if run on existing telephone poles or through buildings and sewers. More use must be made of messengers and pre-arranged audio and visual signals. Imaginative positioning of antennas, such as intermingling them with existing civilian antennas or in treetops, may increase transmission range and enhance the survivability of the unit. Accurate and timely detection, identification, and location of ground targets and the determination of their size and disposition on the ground are essential for accurately computing firing data. Determining the appropriate time and type of attack requires that the target size (radius or other dimensions) and the direction and speed of movement be considered. Target location is primarily determined by use of target acquisition assets and sensing platforms. Other sources include maneuverand special operations forces. The PADS provides accurate survey data for survey control points used by launchers. Accurate firing point location is a function of the launcher SRP/PDS based on the initial survey data. It can also be derived at the firing point directly from GPS. The ballistic algorithm imbedded in the EU of the launcher FCS takes into account specific ammunition information (weight, ambient temp, and ammunition type). The effects of weather on the rocket must be considered and the firing solution must compensate for those effects. Use of current meteorological information in the FCS allows the firing solution to compensate for current weather conditions.The computation of firing data must be accurate. Special applications programs (SPAR) programmed in the launcher FCS yield accurate and timely firing data. Individual and collective training reduce the probability of procedural or data input error.